Wednesday evening August 1st found me at Mt. Irenaeus Franciscan Mountain Retreat Center for an “Evening of Re-Creation.” Each summer for the past seven years I've spent Wednesday evenings in June, July and early August at the Mountain. Following Eucharist at 4:45 I found myself sitting on the porch before a dish-to-pass-supper was served. That evening fellow St. Irenaeus Secular Franciscans Bonnie and Larry Orsini were present. Larry said, “Don, would you like to come to Philadelphia with us tomorrow?” That day had been a particularly stressful one at work and it seemed that the Holy Spirit was actually leading me to take a break from the routine of summer work. I said, “I'll have to ask Diane.” Diane (my wife) was also along this evening. After consulting with my spouse I agreed to meet Bonnie and Larry that next morning in Olean, NY and accompany them to St. Francis Inn in Philadelphia, PA. I found out later that we would be meeting another Secular Franciscan, Agnes Brush and her husband Tom, in Philadelphia. We had an enjoyable trip. We had beautiful weather and relatively little traffic until we arrived in the metropolitan Philadelphia area. I knew of St. Francis Inn and I'd even watched parts of the Gerry Straub video, “Room at the Inn,” but nothing could have really prepared me for what I was to experience in the next several days. As we drove down Broad Street and turned onto Cumberland and headed for the Kensington area, we passed from what might be called middle America to what is called the “Badlands”. This area is appropriately named. We finally arrived at our destination on the corner of Kensington and Hagert. Barbara Salapek and Fr. Michael Duffy, OFM, greeted us as we arrived and after stowing our bags in our accommodations at 1807 Hagert Street adjacent to the Inn, we went to work. Barbara assigned us our work detail. Larry and Bonnie were waiters in the Inn dining room and I worked with Karen Pushaw, another St. Francis Inn staff member in the kitchen. My job was to wash dishes. It's been years since I washed that many dishes. Tables were bussed and I got to scrape and spray off dishes before placing them in racks in the automatic washer. The ambient temperature in Philadelphia that Thursday was 90 F. I don't know what it was next to that dishwasher, but with rinse cycles above 190 F, it was very steamy. After 90 minutes St. Francis Inn had served over three hundred dinners and I'd had a hand in washing all the dishes that went along with that. I was drained. After helping with the cleanup, I joined Bonnie, Larry and the rest of the community for evening prayer in the chapel. As I sat in the prayerful quiet I thanked God for bringing me to St. Francis Inn. For most of the summer I'd wanted to get away for a retreat and this was it. This wasn't what I would have picked as a retreat. Most people wouldn't consider serving food to prostitutes, drug addicts, alcoholics, mentally challenged and ordinary poor folks as much of a retreat, but here there was solitude. The solitude that I had been looking for. When we got back to the apartment I crashed. I woke up an hour or so later to the voices of Agnes and Tom Brush who had arrived while I was napping. We closed the evening sharing our day and adjourned to our quarters for the evening. Friday morning found us up, showered, dressed and in the chapel for 8:30 a.m. Mass. Brother Xavier De La Huerta, OFM, greeted us. Xavier seemed angelic to me. His cherubic smile and warm greeting made me feel very good. Mass at St. Francis Inn is unique. We were seated in comfortable chairs and our celebrant was seated in front of us. A large cross hung behind Fr. Bill as he said Mass. The chapel is small but more than adequate and very Franciscan. Following Mass we went downstairs and prepared for the midday meal. We found out that Friday, Saturday and Sunday meals are only served from 11:30 to 1. We would have only one meal to serve. Karen got me started dishing up chicken salad from the night before and that formed the basis for “side door” meals. Side door meals are served to those folks who cause too much difficulty to be served in the regular dining room at St. Francis Inn. A sign on the side door states, “Smile, Jesus is at the door;” another lesson on my retreat, we were serving the Lord himself in the person of all these poor folks. Friday found Tom Brush and I washing dishes. Agnes and Bonnie worked as waitresses in the dining room and Larry got to go with Barbara to collect food from merchants located all over the Philadelphia area who donate food. By 1 p.m. Tom and I were whipped. The ladies had served nearly 300 lunches and we'd done the dishes. Our customers had come from all over and though I wanted to take their pictures for an article like this, I couldn't bring myself to do that. Their sacred presence would seem to be defiled by such an act. I did manage to sneak one cell phone picture with my phone of the dining room, but it really does not do justice to the scene of broken people coming for a fresh meal, a smile and some love from Franciscans and other volunteers who work at the Inn. Each day we began with Mass at 8:30, followed by the noon meal. Each day we worked together as Franciscan brothers and sisters as servants of the Most High. On Friday and Saturday night we managed to escape out of the Kensington area for pizza and Philly cheese steak hoagies. We even sampled some delicious ice cream at a Coldstone Creamery nearby. 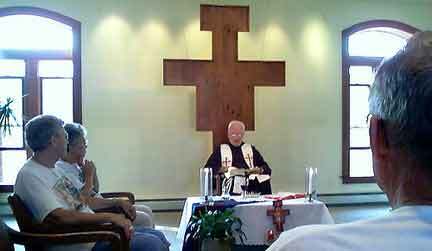 Father Mike offers Mass in the St. Francis Inn Chapel. I felt a bit guilty leaving our guests behind. We come from different worlds and the people of Kensington and Hagert are the lepers of the 21st Century. We are called to serve the poor and though I would not trade places with my unfortunate brothers and sisters of the Badlands, I am humbled to have seen Christ face to face in their eyes. As we prepared to leave after the noon meal on Sunday, Fr. Michael came to wish us well and thank us for our service. I for one felt genuinely grateful to have had the opportunity to serve.